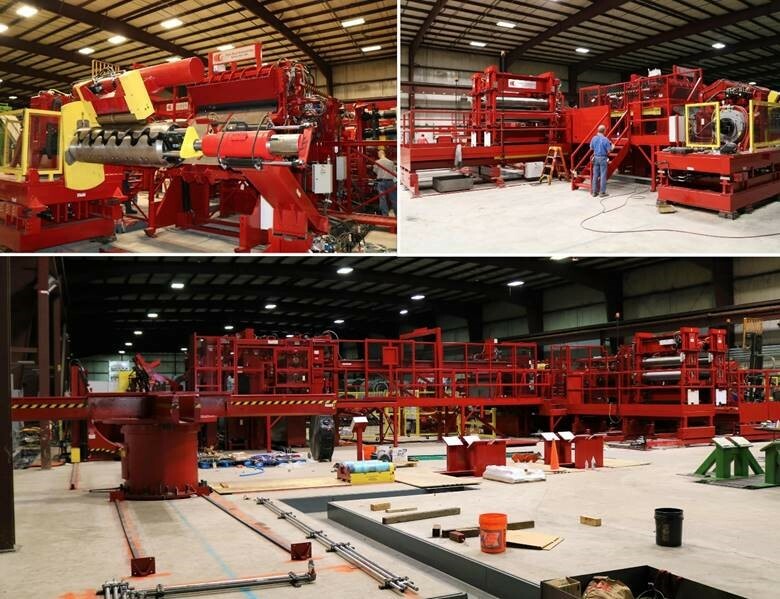 Red Bud Industries recently completed the installation of a 0.625” (16 mm) x 76” (2000 mm) Heavy Gage Cut To Length Line with Stretcher Leveler for Ratner Steel, a steel service center headquartered in Roseville, Minnesota. It was Ratner’s fourth Stretcher Leveler purchased from Red Bud Industries. 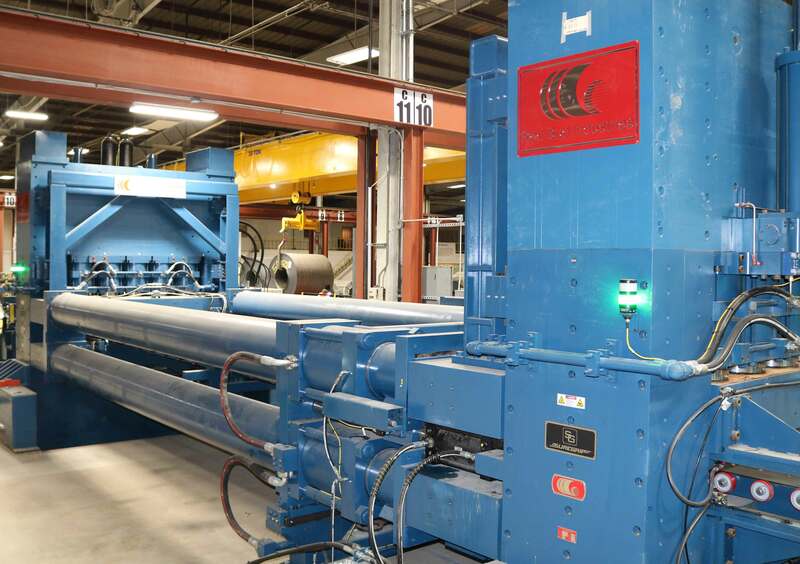 The new line was installed at Ratner Steel’s new facility in Osceola, Arkansas. The new line features Red Bud Industries’ T2 series Stretcher Leveler with a 30’ (9 m) stretch bed. In addition, this unit includes proprietary “Quick Draw” technology which produces the fastest stretch cycle times in the industry. SUREGRIP® long life metallic grippers and a powered gripper extraction system were also provided. 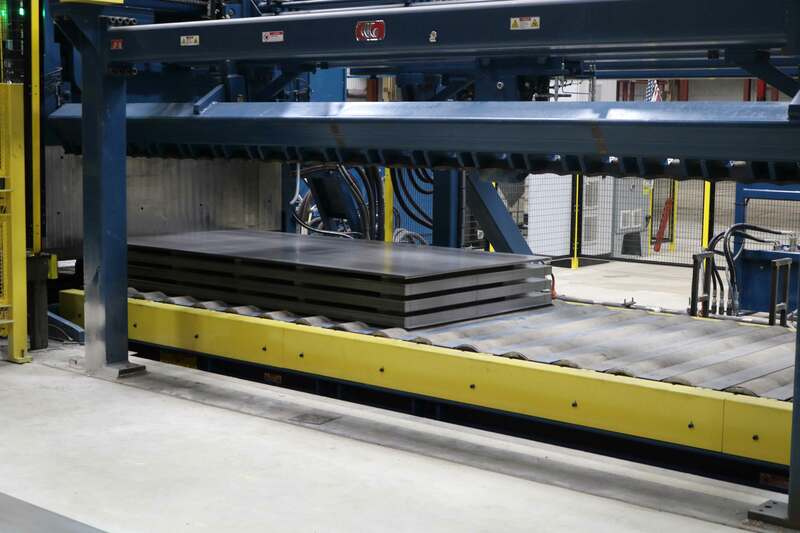 The Line also features 60,000 lb (27,000 kg) Stack Tables with 60” (1524 mm) of vertical lift. 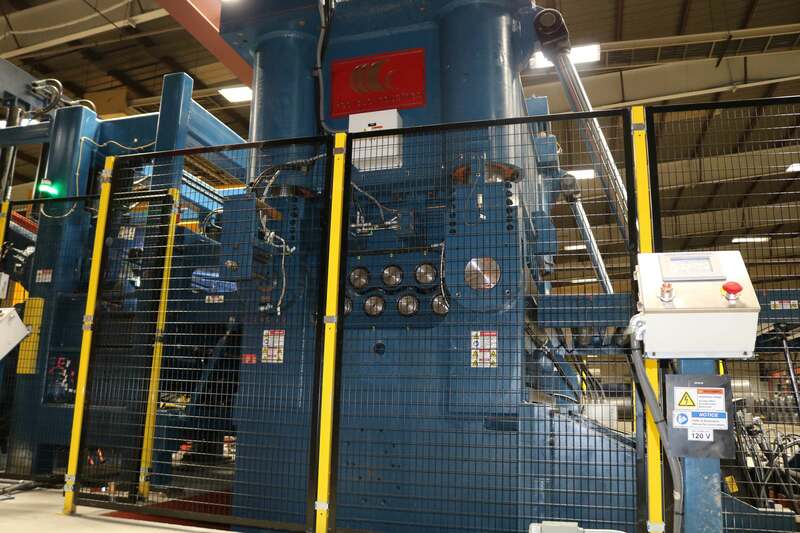 This allows Ratner Steel to process an entire coil onto a single stack. The result is improved material handling and throughput. 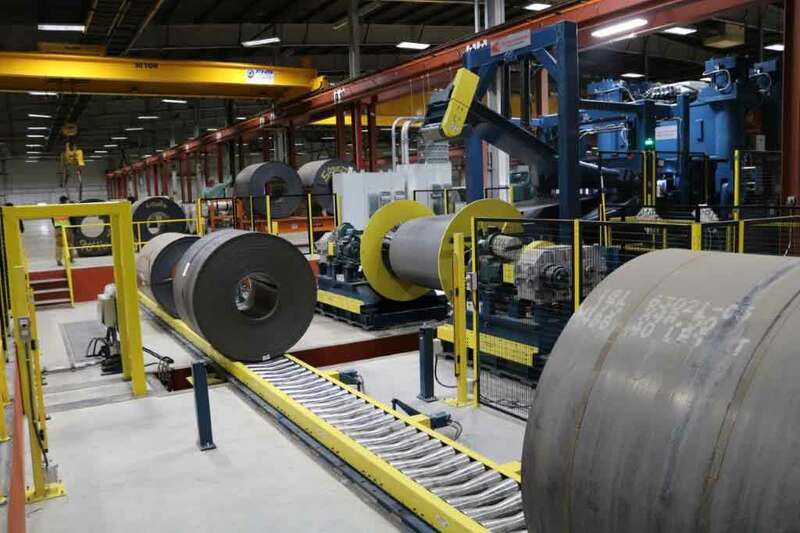 Ratner Steel’s new line can handle coils up to 80,000 lbs (36,000 kg). 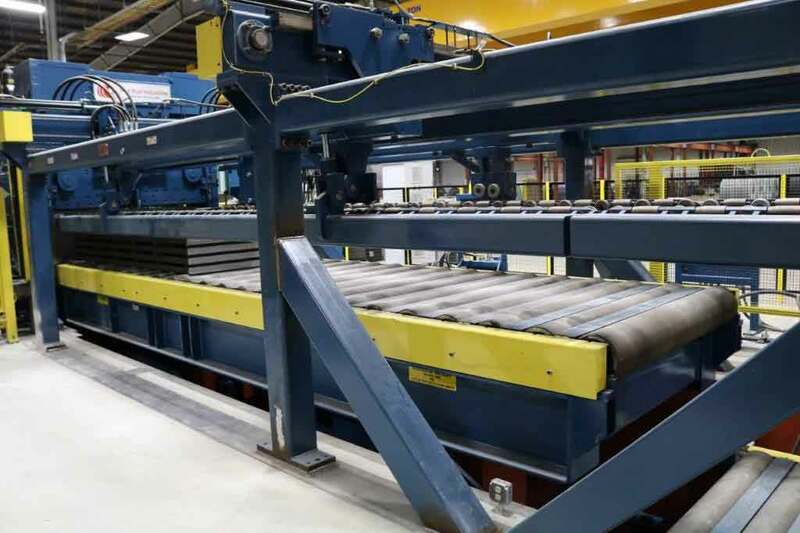 The line consists of an Entry Coil Car, Dual Uncoiler, Heavy Gage Peeler/Breaker, Pop Top Precision 4 HI Flattener, Stretcher Leveler, Servo Roll Feed, Variable Rake Shear, Heavy Gage Drop Stacker, 60,000 lb (27,000 kg) Stack Tables, and End Discharge Rollouts. 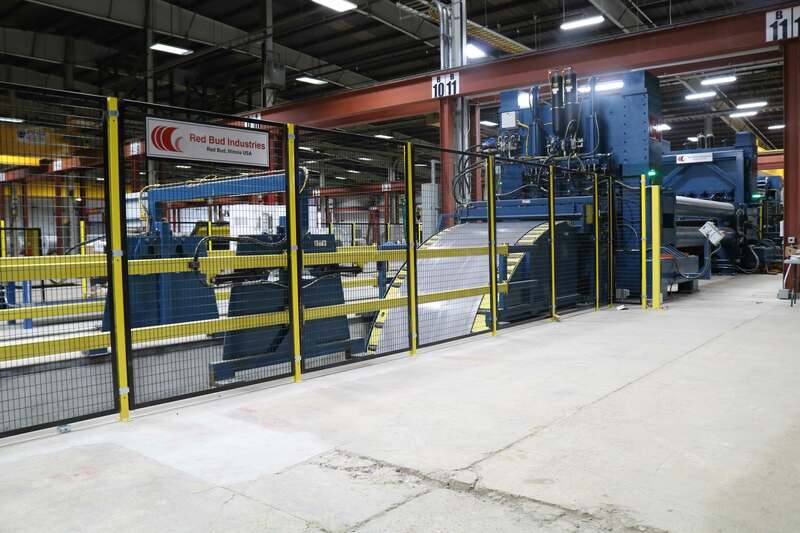 Dimensional Metals Inc., a metal building supplier, located in Reynoldsburg, Ohio, has installed a Red Bud Industries Light Gage Slitting Line. The new line is capable of Slitting material 0.060” (1.5 mm) x 48” (1220 mm) with coil weights up to 20,000 lbs (9,000 kg). Red Bud Industries is located in Red Bud, Illinois. The line consists of an Entry Coil Lift, Traversing Uncoiler, Support Table with Pinch Rolls, PVC Applicator, Crop Shear, Slitter Head, Ball Scrap Winders, Thread System, Recoiler with Coil Pusher, and Exit Coil Lift. 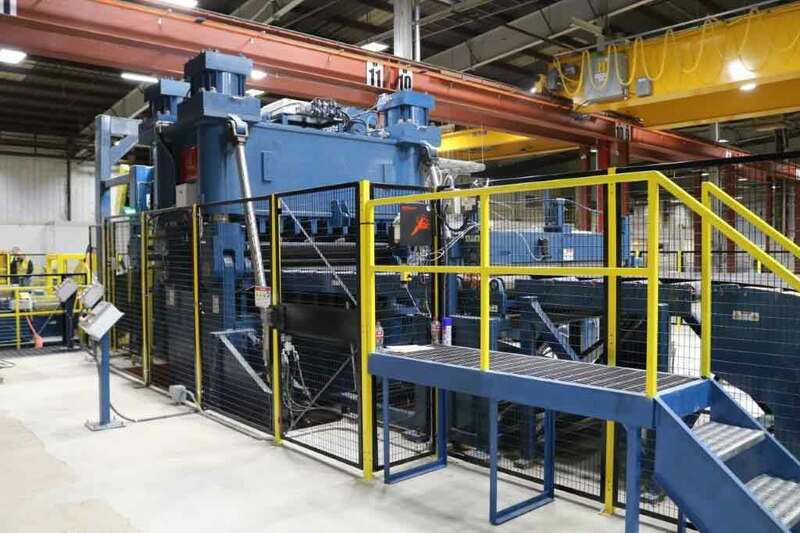 Conklin Metal Industries, a steel service center located in Atlanta, Georgia, recently installed a new Red Bud Industries Precision Blanking Line. The new line is capable of cutting and blanking material up to 0.078” (2 mm) by 60” (1600mm) at coil weights up to 50,000 lbs (22,680 kg). The line also has Beading and Coil Break Down Capabilities. 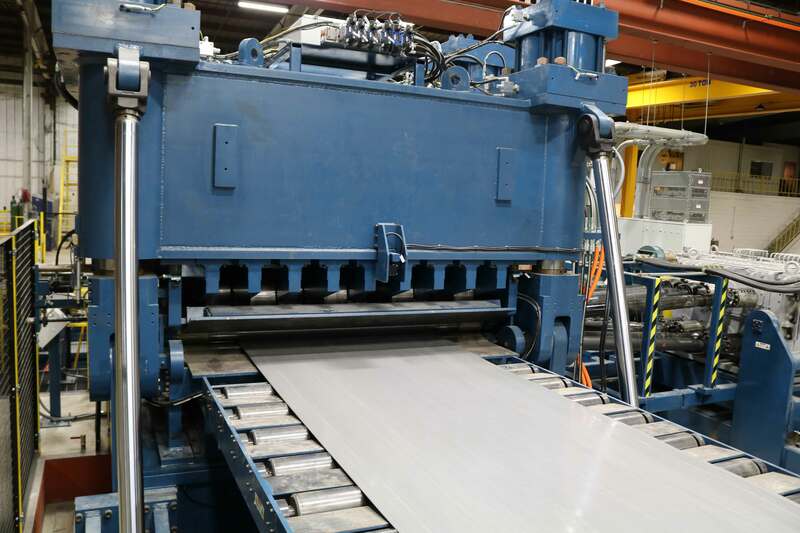 The line consists of a Coil Stage and Load System, Uncoiler, Peeler Breaker, Roller Leveler, Pop-Up Flatness Table, Thread System, Roll Feed, Shear, Drop Stacker, Automatic Lowering Stack table, and End Discharge Rollouts, and Recoiler for coil breakdowns. Also included in the line is Red Bud’s new Time Tracking system that monitors line downtime in effort to improve efficiency. 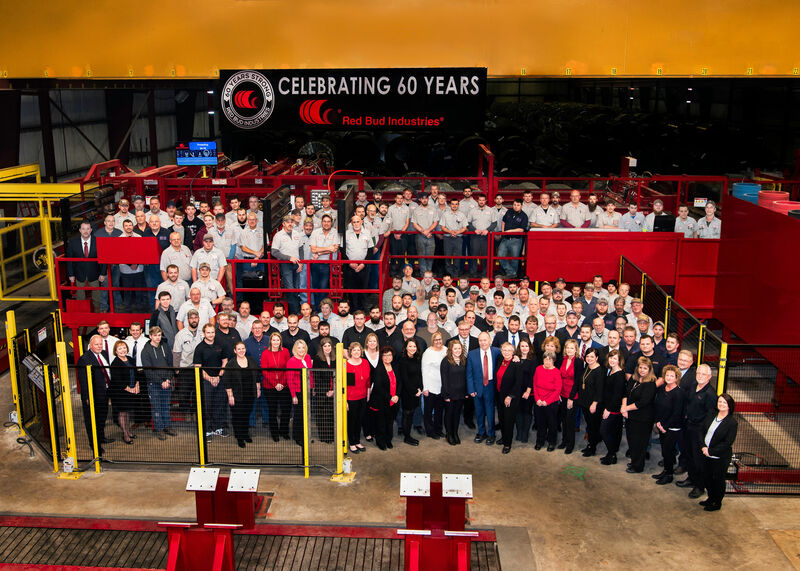 Red Bud Industries is honored to be celebrating its 60th anniversary as a leading manufacturer of Coil Processing Equipment. The family owned company was founded in 1959 by Ken Voges. From humble beginnings, Ken grew the company in the early years by offering machine shop services for local industry. 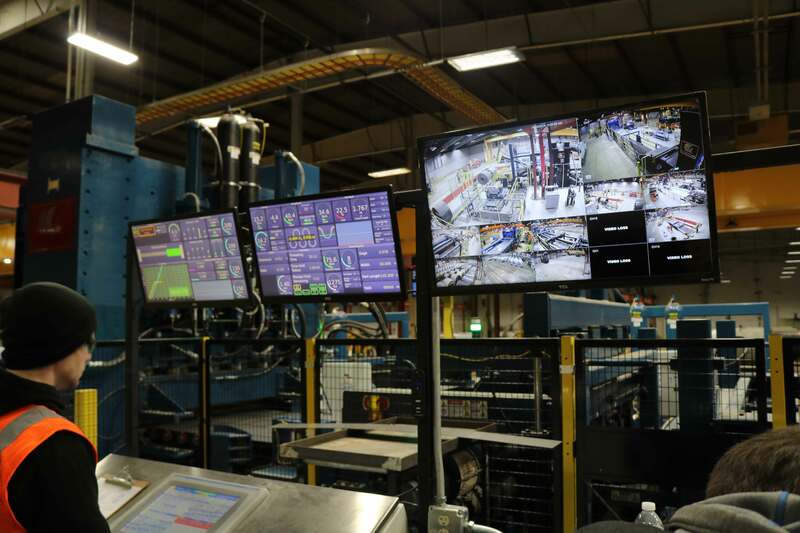 As the company’s product line continued to grow, some of the biggest names in the steel industry began to rely on Red Bud Industries to supply them with world class Processing Equipment. Today, the company has over 1200 installations worldwide. 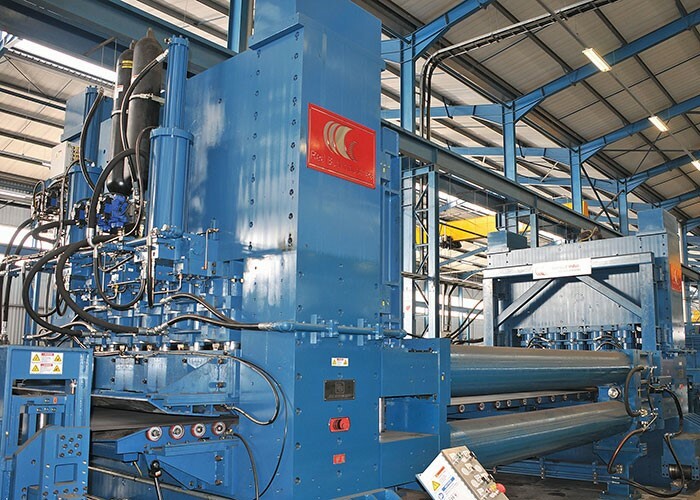 Its equipment can be found operating in every major steel market throughout the world. For 60 years, Red Bud Industries’ commitment to its customers has remained the same; to be the very best supplier of Coil Processing Equipment, while also providing the best support in the industry. Metalworking News recently published a news article showcasing Allied Steelrode’s Red Bud Industries equipment. 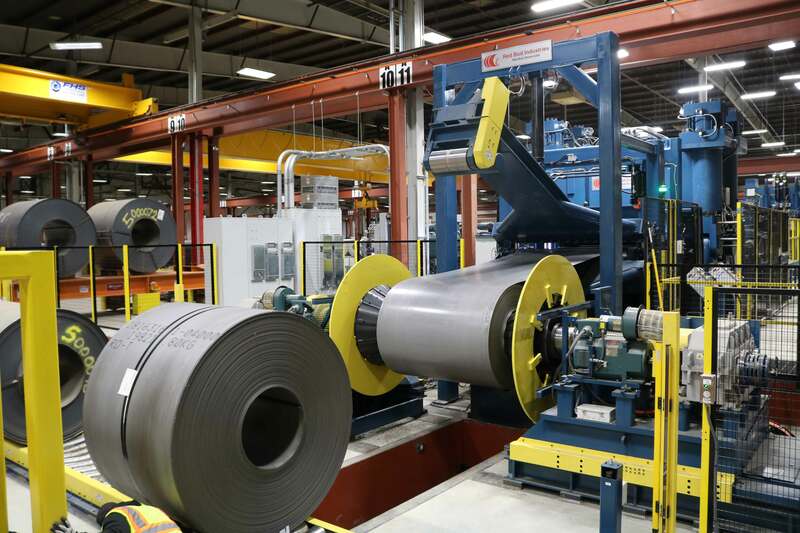 With a full Heavy Gage Cut-to-Length Line and two Stretcher Levelers, Allied Steelrode has made the investments necessary to set themselves apart of the competition. Check out a few photos of the new .315” x 72” Red Bud Industries Slitting Line that is currently being installed at The Material Works. A Red Bud Industries Fully Automatic Packaging Line will also be incorporated. 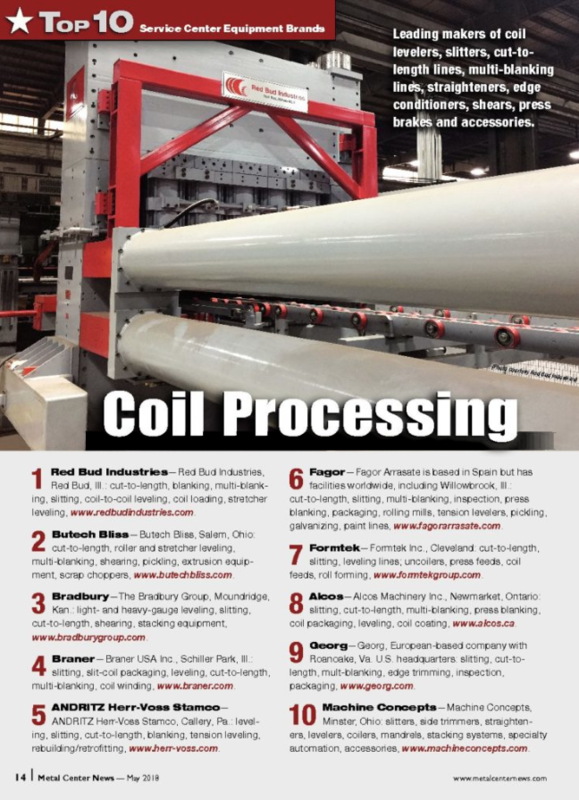 Red Bud Industries has been voted the #1 Coil Processing Equipment Brand in the Metal Center News’ survey for the third year in a row. Our mission at Red Bud Industries is to provide the very best products and service in the industry. We would like to thank all of our customers around the world for putting their trust in our company, and we look forward to continuing our relationship with our customers for years to come.